The Percent Shear / Lateral Expansion / Charpy Dimension Verification System - QPM 7000 Series dimension verification system allows the user to comply with the current ASTM E 23 methods for measuring percent shear fracture area. Although this can be tedious and inaccurate. While the use of a lateral expansion gage is adequate for standard specimens, miniature and subsize specimens often require an alternative procedure. With the QPM system a new technology has been developed for accurate shear and lateral expansion measurement. 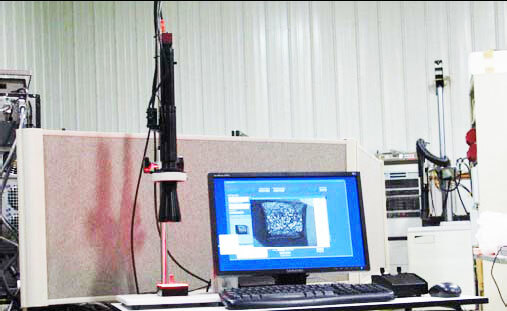 In addition, the system can be used for Charpy notch and other important dimensional verification. The hardware and software are used for acquiring fracture surface and notch images. After the image is acquired, the software is used to make measurements in accordance with the ASTM E 23 standard. The system consists of a camera, lens, lighting, and data acquisition software. An accurate digitized image of the fracture surface is used for the percent shear measurement. The brittle and ductile fracture regions are outlined and the software automatically calculates the % shear area. In addition, the software package includes 5 equations which use the instrumented striker characteristic load data to calculate % shear. This latter method is very effective for materials where the brittle region is difficult to resolve. 7200 System for % Shear Determination and Charpy Dimensional Measurement with Manual Magnification Control. A high accuracy reticle or other calibration tool can be used for this purpose. The lateral expansion measurement is made in accordance with ASTM E23 directly on the fracture surface. The final result is calculated based on the measurements made on the two specimen halves. Measurement of Charpy dimensions requires a telecentric lens and backlighting to achieve high accuracy. In most cases, the notch radius is measured using magnifications ~50 to 100 X (other ranges can be supplied upon request). Lower magnifications are used for the measurement of the notch depth, notch angle, and cross section. 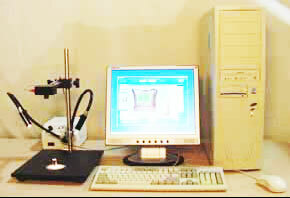 This system is capable of % shear determination and some low magnification qualitative Charpy specimen dimensional measurements. This system is capable of % shear determination, lateral expansion measurement, and dimensional measurements of the Charpy specimen for verification in accordance with E 23. This system includes a telecentric lens with magnifications as high as 125 X for accurate notch radius measurement. The 7200 requires manual adjustment of the zoom (see 7300 for fully automatic operation). The system includes a detent zoom which enables return to 4 fixed zoom levels without the need to re-calibrate the system. This system is capable of % shear determination, lateral expansion measurement, and dimensional measurements of the Charpy specimen for verification in accordance with E 23. This system includes a telecentric lens with magnifications as high as 125 X for accurate notch radius measurement. The 7300 operates under computer control for fully automatic operation. The user specifies the measurements to be made and the software will adjust the zoom, acquire the needed images, and automatically make the measurements. The system includes a 2 phase stepper motor with manual control as well as electronic switches for accurate position encoder calibration. When a desired zoom level is specified, the stepper motor goes to the electronic switch that corresponds to the lowest system magnification, and then proceeds to the desired zoom. Since the desired zoom is very accurately achieved, it is not necessary to calibrate the user specified zoom levels other than at fixed time intervals or after movement of the system.